March 24, The Iran Project – The following timeline lists all visits made by over 65 high-ranking world officials and leaders with Iranian President Hassan Rouhani during 1397 (2018-2019). Arranged in order of time, the timeline may not reflect all of the visits by top foreign officials. Rouhani began his first visit abroad in the new Iranian year to Ashgabat where the two presidents held “very constructive and valuable” talks and made “good decisions” in line with the interests of the two nations. Iranian President Hassan Rouhani was accorded official welcome by his Azeri counterpart Ilham Aliyev in Baku. In the welcoming ceremony, the two presidents reviewed the guard of honor after the national anthems of both countries were played. Iranian President Hassan Rouhani held talks in Ankara with his Turkish counterpart Tayyip Erdogan ahead of a three-way summit with Russia on the Syrian conflict. At a bilateral meeting with Russian President Putin in Ankara, Iranian President Hassan Rouhani told his Russian counterpart that all efforts should be focused to stop Saudi war against Yemeni people. Iranian President Hassan Rouhani welcomed progress in fostering relations with Russia at a meeting with Speaker of Russia’s lower house, the State Duma, Vyacheslav Volodin. Iranian President Rouhani told the visiting Turkish Economy Minister Nihat Zeybekci that bilateral relations of Iran and Turkey are beneficial for regional and international peace and stability. President Rouhani met with the foreign minister of Turkmenistan and stressed that “The Islamic Republic of Iran is determined to deepen ties with all neighbors, including Turkmenistan as a friend and brother country”. Iranian President Hassan Rouhani officially welcomed his Sri Lankan counterpart Maithripala Sirisena at Saadabad Cultural and Historical Complex in Tehran. Sirisena headed a high-ranking politico-economic delegation in Tehran on an official visit. Iranian President Hassan Rouhani landed in Istanbul to attend OIC extraordinary summit on the latest serious developments in the State of Palestine. The Iranian and Jordanian heads of state have reportedly held a brief meeting on the sidelines of a special summit of the Organization of Islamic Cooperation (OIC) in Turkey. In September 2003, Iran’s then-president Mohammad Khatami met with King Abdullah II in Tehran. In a meeting with his Turkish counterpart Recep Tayyip Erdogan, the Iranian president underlined the need for both countries to promote their cooperation in transportation and other fields of interest particularly in defending the rights of the oppressed Palestinian nation. Turkmen President Gurbanguly Berdymukhammedov in a meeting with President Rouhani said that Ashgabat and Tehran are ready to broaden economic cooperation, taking into account existing opportunities and realities of the contemporary era. Speaking in a meeting with President Mamnoon Hussain of Pakistan, Dr. Hassan Rouhani said: “Iran is ready to have mutual investment with Pakistan in various fields”. Russian President Vladimir Putin noted specific results of Russia-Iran cooperation in settling the Syrian conflict as he spoke with Iranian President Hassan Rouhani on the sidelines of the summit of the Shanghai Cooperation Organization (SCO). Rouhani met Mongolian President Khaltmaagiin Battulga in China, during the meeting Dr. Hassan Rouhani said: “The development of economic relations is emphasized by us and in the interest of the two nations, and we encourage Iranian private sector and businessmen to participate in Mongolian development projects”. Rouhani met India’s Prime Minister Narendra Damodardas Modi on the sidelines of the SCO summit in China, in the meeting Dr. Hassan Rouhani expressed satisfaction over the growing Tehran-New Delhi relations and welcomed India’s active participation in the development project of Chabahar Port. Iran’s President Hassan Rouhani has conferred with his Chinese counterpart Xi Jinping on a multilateral nuclear agreement Tehran signed with the P5+1 group of countries in 2015 and mutual relations, particularly in economic and trade sectors. The Presidents of the Islamic Republic of Iran and Swiss Confederation discussed ways of expanding relations between the two countries in all areas of mutual interest. Rouhani met Austrian chancellor Sebastian Kurz in Vienna. In the meeting, Iranian President slammed as illegal the US withdrawal from the 2015 nuclear agreement, known as the Joint Comprehensive Plan of Action, and said Washington’s move benefits no one. In a meeting with North Korean Foreign Minister Ri Yong-ho in Tehran, Iranian President Hassan Rouhani warned North Korea against trusting the US and said that the Trump administration is unreliable and leaves international agreements unilaterally. Presidents of the Islamic Republic of Iran and the Russian Federation met on the margins of Caspian Sea Littoral States Summit in Kazakhstan and discussed the most important bilateral, regional, and international issues. Iranian President Hassan Rouhani met his Kazakh counterpart, Nursultan Nazarbayev. The meeting was held on the sidelines of the Caspian Sea Littoral States summit. In a meeting with Iranian President Hassan Rouhani on the sidelines of the Caspian summit in Kazakhstan, the Azeri president said his country condemns the American sanctions against the Iranian nation. Iranian President Hassan Rouhani and Russian President Vladimir Putin held a bilateral meeting in Tehran before the official start of the trilateral summit with Turkish president Erdogan. The two heads of states discussed the latest developments in bilateral relations, the Syrian crisis, international developments and the JCPOA. Iranian and Turkish presidents met and discussed the latest developments in the region, including the Syria crisis. President Hassan Rouhani held talks with Managing Director of International Monetary Fund (IMF) Christine Lagarde in New York. Rouhani traveled to New York to attend the 73rd UN General Assembly Session, after meeting with the US media directors, interview with NBC, held talks with Christine Lagarde. Rouhani met his Turkish counterpart Recep Tayyip Recep Erdogan on the sidelines of 73rd session of the United Nations General Assembly (UNGA) annual meetings. During the meeting, both sides discussed the most important bilateral, regional and international issues. Iranian President Hassan Rouhani called on the international community to stand firmly against US breach of its commitments. President Rouhani made the remarks in a meeting with Bolivian counterpart Evo Morales which was held on the sidelines of the 73rd session of the United Nations General Assembly (UNGA) annual meetings. Iranian President Hassan Rouhani met with President of the International Olympic Committee Thomas Bach on the sidelines of the United Nations General Assembly in New York. Iranian President Hassan Rouhani met with President Emmanuel Macron of France at the UN headquarters in New York. Norwegian Prime Minister Erna Solberg held talks with Iranian President Hassan Rouhani in New York on bilateral ties and other issues of mutual interests. The meeting took place at the residence of the Iranian president in New York on the sidelines of the 73rd meeting of the United Nations General Assembly. Armenian Prime Minister Nikol Pashinyan visited Iranian President Hassan Rouhani at his residence in New York and discussed with him issues of mutual interests and regional cooperation. Rouhani met UK Prime Minister Theresa May on the sidelines of the UN General Assembly Session in New York. May expressed condolences over the recent deadly terrorist attack in southwestern Iran. Belgian Prime Minister Charles Michel held talks with Iranian President Hassan Rouhani on issues of mutual interests on the sidelines of the 73rd session of the UN General Assembly. Michel’s meeting with Rouhani revealed the fact that despite US unilateralism Belgium would like to improve and expand relations with Iran. Speaking in a meeting with the Prime Minister of Malaysia Mahathir Bin Mohamad in New York, President Hassan Rouhani hailed the steps taken to cement relations between the two countries in different fields such as energy, joint ventures, and scientific cooperation. In a meeting with President Alain Berset of Switzerland in New York, President Hassan Rouhani described the development of relations and cooperation between Iran and Switzerland in different political, economic and cultural fields important. President of the Islamic Republic of Iran and Prime Minister of Japan had a meeting in New York and discussed the most important bilateral, regional and international issues. Speaking in a meeting with Prime Minister Giuseppe Conte of Italy in New York, President Hassan Rouhani appreciated Italian government and nation’s condolences over the terrorist attack in Ahwaz. In the meeting with Secretary-General of the United Nations António Guterres in New York, President Hassan Rouhani said, “The United Nations should carry out its responsibilities in the solidity of international laws, so that no country can violate international commitments, including resolutions of the Security Council”. In a meeting with President Nicolas Maduro of Venezuela in New York, President Hassan Rouhani said, “The people of Iran and Venezuela have continuously been under the aggression and sanctions of the United States”. Iraqi president was officially welcomed and greeted by his Iranian counterpart Hassan Rouani in Sa’adabad cultural and historical complex. In meetings with parliament speakers of Turkey and Pakistan, Iranian President Hassan Rouhani discussed plans for cooperation in the fight against terrorism. Speaking with the speaker of parliament of Russia, Dr. Hassan Rouhani said, “No third-party country is able to undermine the bilateral, regional and international relations between Iran and Russia”. Speaking in a meeting with the Speaker of Parliament of Afghanistan, President Rouhani described economic relations between Iran and Afghanistan as requiring a major transformation and stressed that Tehran is ready to cooperate with Kabul in economic fields. Iranian President Hassan Rouhani and his Turkish counterpart held bilateral talks in Ankara prior to the 5th high council meeting for strategic cooperation between the two sides’ delegations In the Turkish capital behind closed doors. In a meeting with Secretary General of the Palestinian Islamic Jihad resistance movement Ziad al-Nakhala in Tehran, Rouhani said Iran has been a staunch supporter of the Palestinian nation ever since the 1979 Revolution, led by late Imam Khomeini. President Hassan Rouhani in a meeting with Syrian Foreign Minister Walid Muallem in Tehran stressed that the establishment of full stability, security and normal conditions in Syria for the return of Syrians to their normal life is a key regional goal for Iran. Iranian President Hassan Rouhani and his Russian and Turkish counterparts, Vladimir Putin and Recep Tayyip Erdogan, held separate talks in the Black Sea resort city of Sochi in addition to trilatelal meeting on the Syria crisis. Rouhani met Syrian President Bashar al-Assad in Tehran, during the meeting Rouhani said that the Islamic Republic is ready to help Syria with its reconstruction plans and restore stability to the war-ravaged country. Iran’s President Hassan Rouhani received Armenian Prime Minister Nikol Pashinyan at Sa’dabad Complex in Tehran. Promoting bilateral relations in various fields was one of the pivotal topics of talks between Pashinyan and Iranian officials. Iranian president met Shahin Mustafayev, the Minister of Economy of the Republic of Azerbaijan. In a meeting with the Iraqi Parliament Speaker Mohammed al-Halbousi, President Rouhani highlighted the two countries’ mutual cooperation for regional stability, fighting terrorism and boosting bilateral relations. President Hassan Rouhani was officially welcomed by the Prime Minister of Iraq Adil Abdul-Mahdi in Baghdad. In the official welcoming ceremony, after the national anthems of the two countries were played, Dr. Rouhani and Prime Minister Abdul-Mahdi reviewed the honor guards and then introduced their high-ranking delegations to each other. 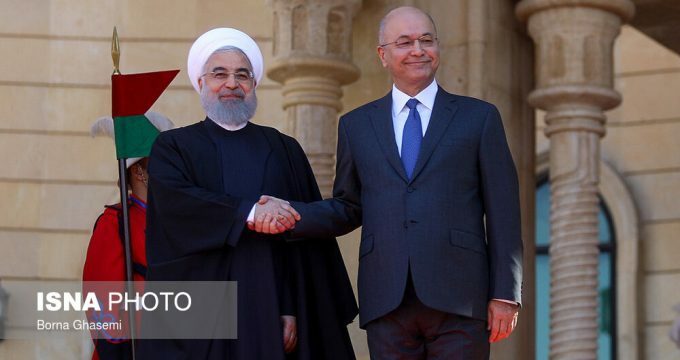 In a meeting with President Barham Salih of Iraq President Hassan Rouhani appreciated the hospitality of the Iraqi government towards the Iranian delegation and expressed hope that the visit would further develop relations between the two countries. In a meeting with Iranian President Hassan Rouhani, the Iraqi tribal chiefs from Karbala and Babil welcomed his visit to the region. The Iranian president, for his part, expressed Iran’s support for the development of all-out ties with Iraq in the reconstruction era. Iranian President Hassan Rouhani and Iraqi Parliament Speaker Mohammed al-Halbousi in a meeting in Baghdad explored avenues for deepening of mutual cooperation. Speaking in a meeting with the Former Prime Minister of Iraq Nouri al-Maliki, Dr. Hassan Rouhani said, “Relations between Iran and Iraq have always been good”. “Iraqi distinguished figures and politicians, in any position, play an important role in the development, security and stability of the country and Tehran-Baghdad relations,” he said. Speaking in a meeting with Advisor of the National Security Council and Chairman of the Popular Mobilization Forces (PMF) of Iraq Falih Alfayyadh, Dr Hassan Rouhani said, “Fighting terrorists in Iraq has been achieved through the Iraqi people’s self-sacrifice and is a great honor for Muslims and the World of Islam”. Speaking with the Leader of National Wisdom Movement of Iraq Sayyid Ammar al-Hakim, Dr. Hassan Rouhani said, “We should attempt to carry out our responsibilities towards the two nations well”. Leader of National Wisdom Movement of Iraq Sayyid Ammar al-Hakim said in the meeting, “Today, Iraq has been able to overcome great challenges and get on the track of reconstruction and development, for which stronger relations with Iran can be effective”. Speaking with the Former Prime Minister of Iraq Haider al-Abadi, Dr Hassan Rouhani said, “We should attempt to promote multilateral cooperation among the countries of the region in different fields such as transit, railways and combatting terrorism”. In a meeting with Iranian President Hassan Rouhani, the Iraqi tribal chiefs from Karbala and Babil welcomed his visit to the region. The Iraqi tribes condemned the US sanctions against Iran and called for improvement of relations between the two countries’ border regions. President of the Islamic Republic of Iran met with Grand Ayatollah Muhammad Is’haq al-Fayadh, one of the senior Shia marja at Najaf Seminary. In the meeting, Grand Ayatollah Fayadh wished Muslims and the Iranian nation success and said that the Iranian government is based on Imam Ali’s (PBUH) government. In a meeting with Grand Ayatollah Muhammad Saeed al-Hakim in Najaf, Hassan Rouhani said Iran and Iraq can further cooperate and play a more significant role in solving regional and international issues. Senior Shia cleric Grand Ayatollah Seyed Ali Sistani in a meeting with Iranian President Hassan Rouhani lauded the role played by the “friendly” states in the victory against the ISIL terrorist group in Iraq. During the meeting in the holy city of Najaf on, Ayatollah Sistani also welcomed any steps to develop Iraq’s relations with its neighbors based on mutual interests, respect for each other’s sovereignty and non-interference in internal affairs of either country.